Remove the replacement fan module from its packaging, and place it on an antistatic mat. 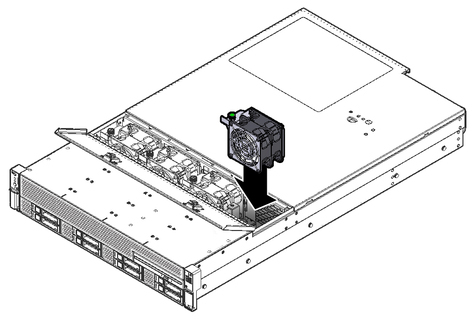 With the top cover fan assembly door open, install the replacement fan module into the server. The fan modules are keyed to ensure that they are installed in the correct orientation. Press down on the fan module and apply firm pressure to fully seat the fan module. Verify that the fan module status LED on the replacement fan module is lit green. Using your thumb and forefinger, tighten the captive screw until finger tight. Then using a No. 2 Phillips screwdriver, tighten the captive screw an additional 1/4 turn to secure the fan module to the chassis. Close the top cover fan assembly door. Verify that the Top Fan LED on the front of the server and the Service Required LEDs on the front and rear of the server are extinguished. See Server General Status Indicators for more information about identifying and interpreting system LEDs. If you installed the fan module as part of another procedure, return to that procedure. Otherwise, return the server to operation.